There are so many bars to choose from in a grocery store. They taste really good, but they’re wrapped in plastic and they have tons of additives. A lot of them claim to be “healthy” but are really just packed with sugar. They’re kind of just like cookies with protein in them. If you want a sugary protein filled snack, why not eat some homemade peanut butter cookies? 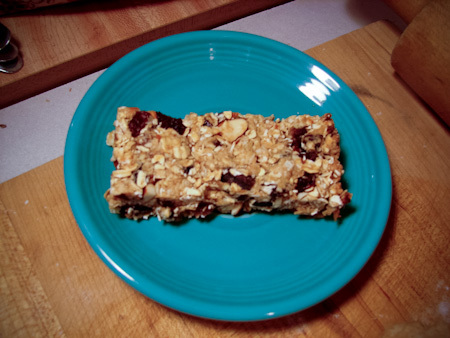 Finding a bar that’s actually healthy can be challenging. After looking at lots of recipes, I found this one and tweaked it a bit. 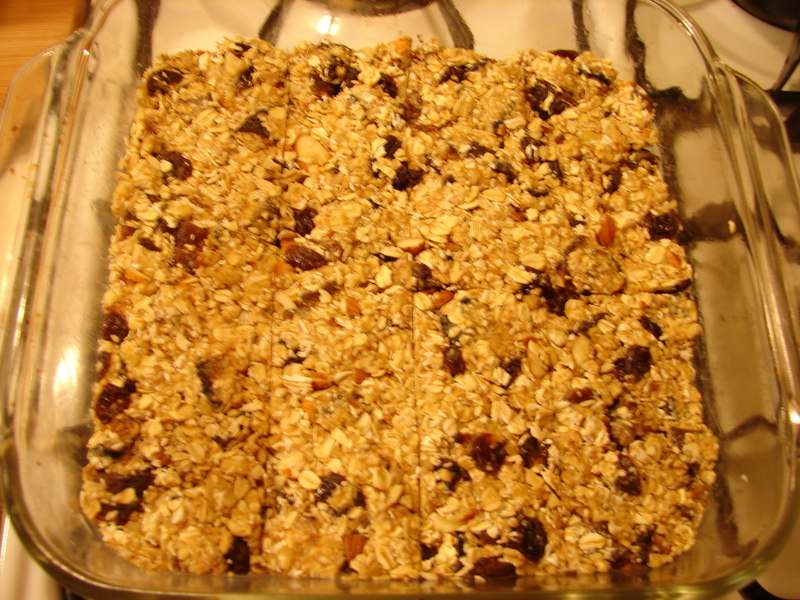 (I’ve made granola bars before, but they were basically just oatmeal cookies.) I decided to use brown rice syrup in these. Brown rice syrup is lower on the glycemic index than other sweeteners. It also has magnesium, potassium, iron, manganese, zinc and B vitamins. You can also use honey though, and although I haven’t tried it, maple syrup would probably work too. 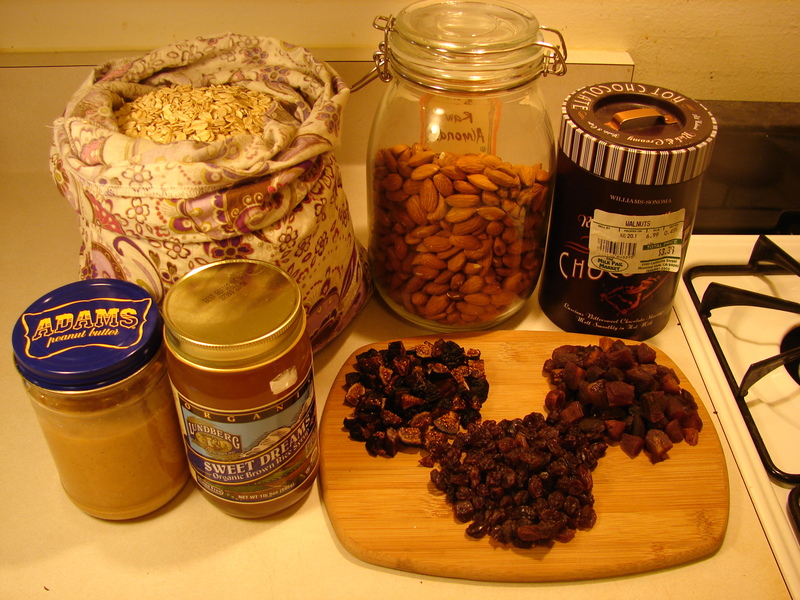 Here are the ingredients I used in my granola bars. I bought the oats, nuts and dried fruits in bulk with cloth bags at Whole Foods. 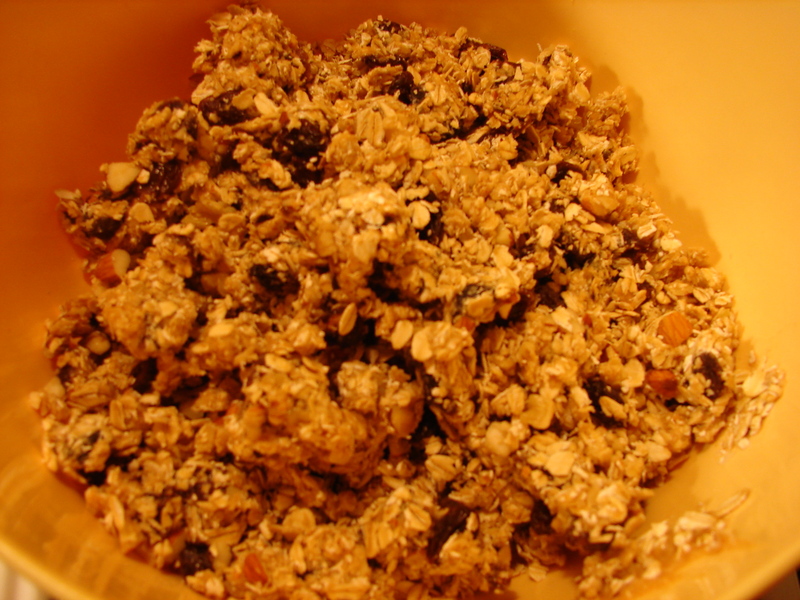 Mix the oats, nuts, fruits and salt in a bowl. (I can’t find my picture of that.) 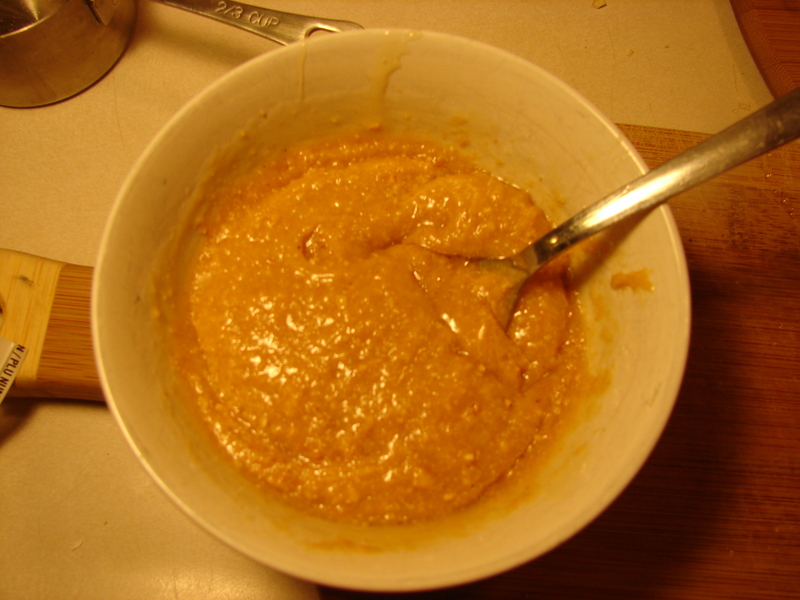 Mix the peanut butter and brown rice syrup in a separate bowl. Add the peanut butter mixture to the oat mixture. It will look crumbly, but don’t worry. Press very firmly into a greased 8×8 pan, and cut into squares. Its much easier to cut them before baking. Since I had cut them before baking, they lifted out of the pan very easily once they had completely cooled. Enjoy with a glass of almond milk. Note: these aren’t super sweet. If you’re looking for a granola bar that tastes like an oatmeal cookie this isn’t it. These have about the same level of sweetness as this granola. Oh! Thanks for noticing. I just fixed it. I used 1/4 cup of brown rice syrup. 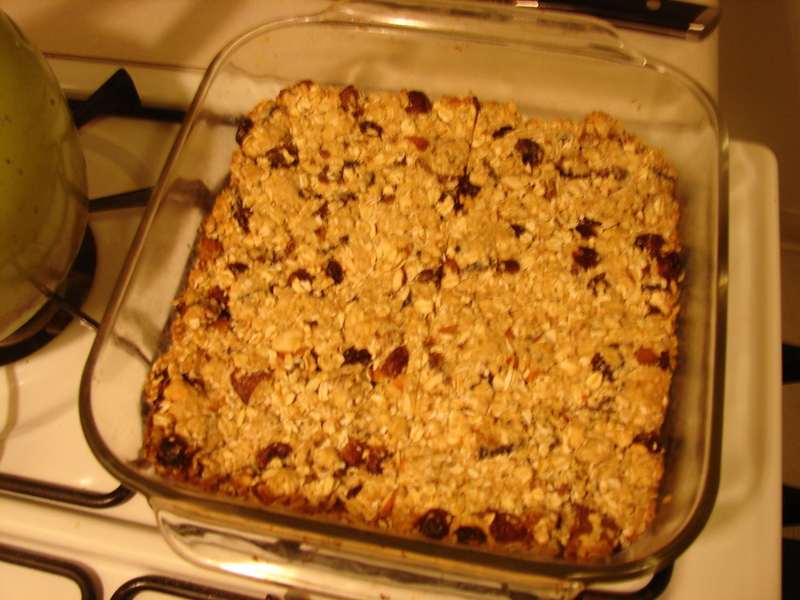 Mine turned out delicious, but super crumbly, so I’ve just turned it into granola. How do I modify to make it stick together better? More syrup or…? (I did substitute the peanut butter for almond butter, but I wouldn’t think that would make too big a difference). Thanks! You have to press them into the pan really firmly. Also, wait for them to cool completely before taking them out of the pan. You could add more peanut butter or brown rice syrup too. Thanks for looking that up! 🙂 I had heard mixed opinions on the topic so I wasn’t sure.